Many of you know that I have struggled with a lot of emotional and mental issues for most of my life. Self-Hate and depression were just the beginning at a very young age. When I added the loss of a child, when I was still a child myself(She went to be with God the day after my 18th birthday), we prayed for the best, but the fear of the worst is there. On April 10, 1989, I could see that fear in my Mother’s eyes. She was scared as to what I would do next. How would I handle it? Would I fall apart? Would I try once again to take my own life like I had years earlier? Well, I have had many break downs since then. Marian’s dad was actually great in the months following our loss. Although we did not stay together, he was a kind and gentle man, especially considering his age(he was 16) and what we had just been through. Marian would be 25 years old now, and I still think of her every day. I don’t mourn her as much as I used to, but I often wonder what she would have been like. And how would my life have been different? I do still have days though. Today is Pregnancy And Infant Loss Remembrance Day. 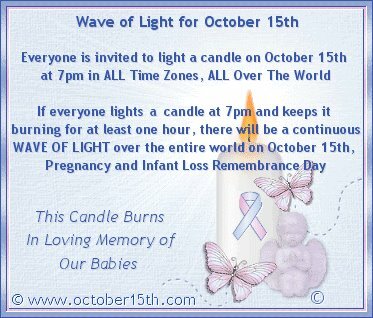 In honor of that, I am asking you all to join me in the Wave of Light to remember our tiny angels. I also want to share with you a poem that was given to me by Marian’s dad after she left us. So as I reach out with my words as a HUGE HUG to all of you today, I hope each of you struggling with an empty place in your arms, but an extra little light in your heart, knowing that such a special little angel was a part of you once. Just because others don’t understand it, does not mean it is not real. If you need help dealing with it, please get it. If you need a friend who will not dismiss your pain, find one. You are not alone. Many of us deal with these feeling EVERY day. Such a beautiful message Brenda- know that your daughter is indeed in a special place and someday you will both be together – blessings!!! Thank You Ava. I didn’t make it through this one with dry eyes.